Like their thecodont ancestors, dinosaurs are extinct diapsid reptiles, often-bipedal—that is, they are extinct reptiles with a pair of holes in the skull behind each eye (figure 45.55), many of which walked on two feet. The great marine (ocean-swimming) reptiles of those times, ichthyosaurs and plesiosaurs, were not dinosaurs, and neither were the flying reptiles, the pterosaurs—these other reptiles did not walk on land as dinosaurs and thecodonts did. Huge therapsids like the sail-back Dimetrodon did walk on land, but they were not dinosaurs, either—these ancestors of mammals were synapsids, with but one hole in the skull behind the eye. Four types of reptiles. Reptiles are put in four subclasses according to their skull design. 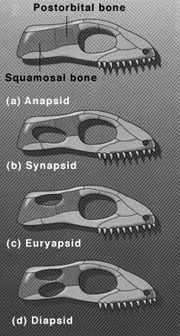 Anapsids have no hole between the postorbital and squamosal bones. Synapsids have one hole displaced inferiorly and between these bones. Euryapsids have one hole displaced superiorly and between these bones, and diapsids have two holes between these bones, one superior and one inferior. Crocodiles are also diapsid reptiles, like dinosaurs direct descendants of thecodonts. Are crocodiles dinosaurs? No. What makes dinosaurs unique, what sets them apart from both crocodiles and thecodonts, are key changes in how they stand and run. A variety of unique features are shared by all dinosaurs that set them apart from thecodonts or any other vertebrates, among them the shape of hand, foot, thighbone, and ankle. Two key anatomical changes are of particular importance, changes which improved speed and agility, providing an important evolutionary advantage to early predacious dinosaurs. Strong knee and ankle joints. In bipedal thecodonts (and crocodiles) the knee and ankles flex in a swiveling motion, supporting a swinging walk. Flexing is possible in their ankle because the bones of the left and right sides are connected by a swiveling peg-and-socket joint. In dinosaurs (and birds) the knee is a simple hinge, and peg-and-socket ankles are gone—the foot gives up its grasping design to become a stiff propulsive level, the dinosaur ankle bones firmly attached to the shin bone. These new knee and ankle structures provide the greater strength and stability necessary to support a bulky body (figure 45.56). Upright stance. Thecodonts stood with their legs angled out, in a “Vee” stance. The top of the leg bone (the femur) juts at an inward angle into a shallow groove on the hipbone (the ileum) to form the hip socket. Because bone builds where force is applied, the ileum is thick behind the groove. Dinosaurs stood upright, with legs positioned directly beneath the body. The top of the femur is angled sharply inward, with a ball-shaped tip that fits into a lip on the socket of the ileum. Because there is no pressure sideways, the side of the ileum has no bone at all—there actually is a hole in the side of the socket, where the ileum meets the two other pelvic bones. Ankle joints of (a) bipedal thecodonts and crocodiles and (b) dinosaurs and birds. The ankle bone in dinosaurs was firmly attached to the shin bones, and this simple hinge construction allowed for a much stronger joint. A dinosaur’s foot is quite different from a human one. The long bones of the foot are not parallel to the ground, as yours are, but bunched together and running upward to the ankle joint, like a horse’s do—so, like horses, dinosaurs walk on their toes at all times. Long slender toes give the dinosaur foot a firm grip on the ground. Nearly all dinosaurs have only three walking toes on the foot. Their footprints are very similar to those of birds! Early in the evolution of dinosaurs, the structure of the hip evolved in two distinct directions (figure 45.57). There are three bones that meet at the dinosaur hip socket, with large powerful leg muscles attached to each of them. 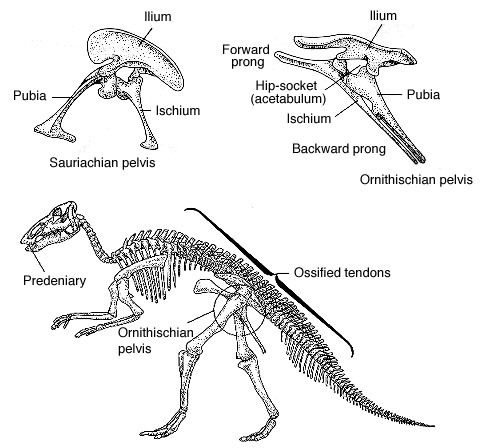 This distinction in hip structure is so clear that it is used to define two orders of dinosaurs—saurischians and ornithischians (see table 45.3). The two orders of dinosaurs differ in their hips. Ornithischian (“bird-hipped”) dinosaurs had a rear-pointing pubis bone, while Saurischian (“lizard-hipped”) dinosaurs had a forward-pointing pubis. Birds, however, evolved from the lizard-hipped dinosaurs! Saurischians. In one kind of dinosaur, the three hip bones radiated in different directions. Because that is the way a lizard’s do today, these are called lizard-hipped dinosaurs. Many of the largest of dinosaurs were lizard-hipped, including enormous vegetarian sauropods and meat-eaters such as Tyrannosaurus rex. Ornithischians. In the other kind of dinosaur, the forward-projecting of the three hip bones is turned back parallel to the rear-projecting one. Because that is the way it is in birds today, these are called bird-hipped dinosaurs. The names do not imply relationships—birds, for example, actually evolved from lizard-hipped dinosaurs! Growth rate. Examination of the fossil bones of babies in dinosaur nests indicate that dinosaur babies grew very fast. This is typical of endotherms (a German shepherd dog goes from one-pound puppy to a 120-pound adult in one year), but unheard of for ectotherms (a python takes 20 years to go from five pounds at birth to 120 pounds). Bone texture. Slow-growing ectotherms like lizards make bones slowly, laying down regular layers of collagen one on top of the other, and need few Haversian canals to transport nutrients into the slow-growing bone. Fast-growing endotherms (mammals and birds) lay down collagen in their fast-growing bones so quickly there isn’t time to form neat parallel rows, and an abundance of Haversian canals are present to bring lots of nutrients to the hard-working bone-building cells. When examined with a microscope, dinosaur bones prove to resemble those of endotherms, with a loosely packed jumble of collagen and many Haversian canals. Isotope ratios. The toes and tails of ectothermic animals are colder than their torsos (its bulk keeps the body’s core warmer), while in endotherms the toes and tails are usually the same temperature as the rest of the body. If dinosaurs were ectothermic, the bones in their extremities would have been formed at a lower temperature that those of their torso, just as in lizards today. This can be tested directly! Bone contains two isotopes (different forms) of oxygen atom, oxygen-16 and oxygen-18, and at high temperature 16O is taken up preferentially into new bone. The bones in the toes and tail of a ectothermic crocodile contain less much 16O than the rib bones for this reason, while the toe bones of an endothermic cow contain the same proportion of 16O as its ribs because its feet are at the same temperature as its torso. When six Cretaceous dinosaurs were examined in 1992, the proportion of 16O in toe, tail, and rib were as similar as in a mammal—these dinosaurs maintained their own body temperature! Jurassic dinosaurs are now being examined. Dinosaurs and endothermy. In truly endothermic animals, the extremities are kept at the same temperature as the rest of the body. By analyzing the pattern of oxygen isotopes laid down in the fossilized bones, scientists have found that some dinosaurs in the Cretaceous exhibited a pattern of oxygen isotopes that indicates an endothermic heat distribution. Sauropods, however, may have been inertial homeotherms, maintaining a constant body temperature due to their size. While their extremities may have contained less heat than the main bulk of the body, sauropods likely maintained a high body temperature simply because their large body volume allowed them to retain heat. Maternal care is rare among reptiles, while almost universal among mammals and birds. Among the living reptiles, only crocodiles care for their young. Dinosaurs laid their eggs in nests, and many kinds of dinosaurs then abandoned their eggs to hatch untended, leaving the hatchlings to fend for themselves, much as a turtle does today. However, in the last 15 years paleontologists examining the nests of hadrosaurs have come across clear evidence that hadrosaurs cared for their young: egg shells within the nests were broken into tiny bits, as if trampled underfoot by hatchlings for a long time; young of different ages died within single nests; dead hatchlings had worn teeth, and so must have been fed in the nest; leg bones of hatchlings are not yet fully formed at birth, and so are not yet ready for walking. These findings indicate the young hadrosaurs were reared in their nests for a considerable time after hatching, fed by their parents. Hadrosaurs appear to have nested in colonies, huge herds migrating across North America in the late Cretaceous, returning each season to nesting grounds to rear young.